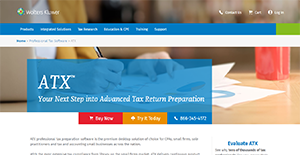 ATX is a premier advanced tax return preparation software. The application designed by Wolters Kluwer’s CCH Small Firm Services provides CPAs, small accounting firms, freelance accountants, and finance teams of businesses with a desktop solution that includes a library of tax compliance forms. With ATX, businesses, entrepreneurs, and accountants can rest assured that they have access to all the necessary forms they require in order to meet regulations at all levels. Moreover, ATX can be integrated with practice management and tax law research systems for a comprehensive software suite. This allows users to enjoy a seamless workflow in all aspects of tax management. With ATX, accountants have access to all the forms necessary for tax compliance. The solution has more than 7,000 forms included in its library that allows users to complete documentation with ease. This vast library also assists accountants in ensuring that they are able to cater to their clients’ or employers’ unique tax needs. ATX has an above-average ease-of-use score according to a 2017 accounting solutions survey. This exceeds the usual score in the industry and is a testament to the user-friendliness of its surface. Users can look forward to a platform that lets them navigate through fields and between up to three forms with ease. That is because ATX is designed like traditional returns so they can utilize the software comfortably. ATX is equipped with an interview tool that walks users through every step of filing compliance forms. This ensures that they fill in all the necessary fields without making mistakes. This also lets them save time in reviewing field entries as the software automatically checks inputted data for errors and possible omissions. This way, accountants can rest assured that their forms are meticulous and compliant. ATX supports multi-tasking for accountants that have to work in between different forms. The interface allows up to three open returns forms while dedicated page, worksheet, and form tabs that let users switch between different kinds of forms expeditiously. This allows e-filers to get more forms done and further increase their productivity. With ATX, users can rest assured that they have access to support they need. The software has an online-based knowledge library that accountants can read whenever they encounter common technical issues. On top of that, they also receive regular newsletters, practice aids, and other productivity tools (depending on their subscribed package) that they can employ in enhancing their knowledge about the product and its uses. If you are interested in ATX it may also be beneficial to examine other subcategories of Best Tax Software gathered in our database of B2B software reviews. Since each enterprise has particular business wants, it is advisable for them to abstain from looking for a one-size-fits-all ideal software application. Needless to say, it would be futile to try to find such an app even among market-leading software solutions. The smart thing to do would be to jot down the various vital aspects that require consideration such as key features, finances, skill levels of workers, company size etc. Then, you should do your groundwork thoroughly. Read some ATX reviews and check out each of the other apps in your shortlist in detail. Such in-depth groundwork can make certain you weed out ill-fitting applications and zero in on the solution that offers all the aspects you require for business success. How Much Does ATX Cost? Wolters Kluwer offers a free one-on-one demo and evaluation for ATX. To learn more, contact the software vendor via phone, email, or web form. We realize that when you make a decision to buy Tax Software it’s important not only to see how experts evaluate it in their reviews, but also to find out if the real people and companies that buy it are actually satisfied with the product. That’s why we’ve created our behavior-based Customer Satisfaction Algorithm™ that gathers customer reviews, comments and ATX reviews across a wide range of social media sites. The data is then presented in an easy to digest form showing how many people had positive and negative experience with ATX. With that information at hand you should be equipped to make an informed buying decision that you won’t regret. ATX Software - Ideally a great software, but has major flaws. Very good experience until I switched to a different software. What are ATX pricing details? What integrations are available for ATX? ATX can integrate with practice management and tax law research systems. Pros: The product was easy to use, there were some problems with the links between forms. I used this product for about 10 years. Cons: The product is expensive if the amount of returns prepared is small. I do between 40-50 returns a year. When I switched to a different software this year (2017 return prep), I was locked out of the software even though I had paid full price and unlimited use for 2016. I think this is unethical. Pros: The user interface of ATX is wonderful. I love the ease of preparing tax returns and sharing it with my team for review. The back up feature is simplified compared to many other desktop software. Also the integration of the research tool (CCH AnswerConnect) into the software was a huge plus. Cons: The back end of the software does not work as intended. You can not efile the returns without the EFIN, as with other software. The process to update the EFIN took us 3 months, despite submitting it the way the software provider suggested. I have used other products in the past, like Drake (Desktop) and ProConnect (Online). The EFIN was updated properly, allowing us to efile with 24-48 hours. The turn around time for ATX is unacceptable compared to it's competitors. The product was easy to use, there were some problems with the links between forms. I used this product for about 10 years. If you need more information about ATX or you simply have a question let us know what you need and we’ll forward your request directly to the vendor.